Jaime and I (Emily) have been planting these hanging gardens the last few year. They are just too beautiful and practical. Here are my two hanging gardens. (Last year's anyway). I was going to make a step-by-step of the planting, but spring is refusing to come this year and I figured if I didn't put this up now, it might be too late for everyone else. So here at least is an explanation. 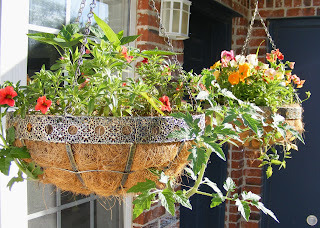 In the first basket I planted bell peppers up top (along with some flowers). Tomatoes were hanging out the bottom. 1. Fill your basket with GOOD quality soil. 2. Plant what you want in the top of your basket. One of my baskets just had pansies and the other had bell peppers in the center and other flowers on the edge. Hang your basket (or set it up on a bucket). 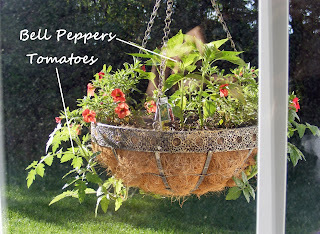 To plant your tomatoes, cut a hole -I usually make an X- in the liner of your hanging basket. Pull the hole open a bit and push the root end of your tomato plant up into the dirt. *hint* don't stand directly under the basket at this point, you'll get a face full of dirt. Just saying. Fold the liner, where you cut your X, back in place around the plant stem. Don't worry, your plant really will stay in place. 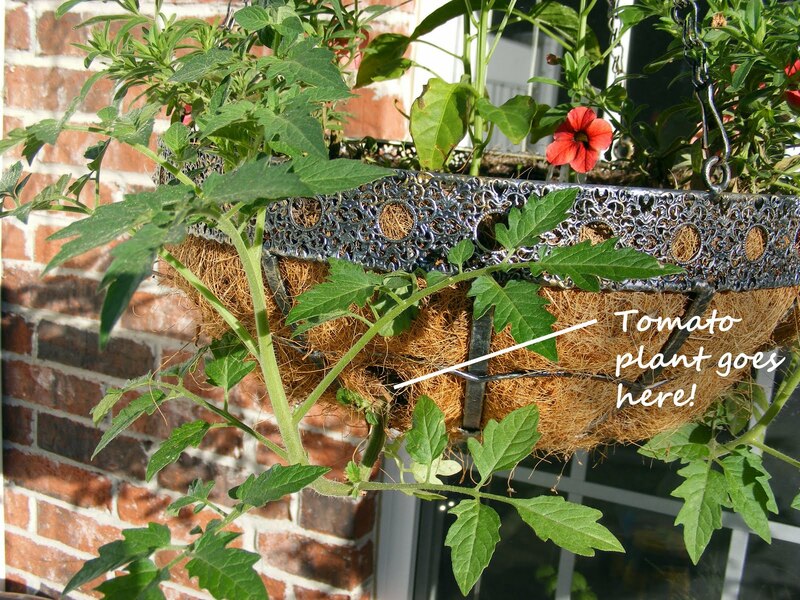 You may want to check the plants up top and make sure you didn't up root any when you put your tomatoes in from the bottom. When you plant your tomatoes they will hang down, but soon they'll start bending upwards toward the light. Keep your tomatoes evenly watered. If you let the soil get dry and then water a lot your tomatoes will split and the skins will be tough. So keep the soil moist. Also, try to plant things in your basket that need a similar amount of water and sunlight. Thank you so much for this! We don't have room for a regular garden this year but this will be perfect for my daughter's beloved tomatoes! What a great idea to combine tomatoes with flowers! I never thought of that. So pretty and functional. So cute! 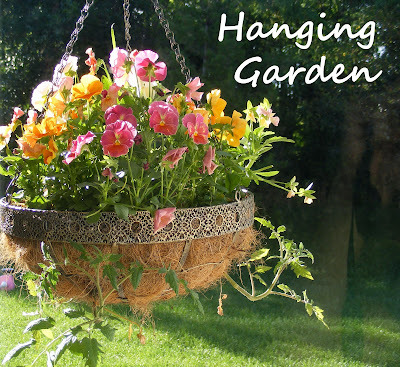 You have some great tips even for regular gardeners. This is awesome!! Saw you at TT&J! I absolutely love this idea! Gorgeous and practical. Thanks for sharing! This looks perfect for me! Thanks for the idea! Love it!! We just moved to a townhouse from somewhere with a big garden area and I was wondering how on earth I was ever going to get sunshine to tomato plants on my covered balcony! Great idea, thanks for linking up!! I am featuring you today on Toast of Tuesday!! Please grab a button!! Even though I have a big yard with tons of gardens...I still love containers! Thanks for sharing at Creative Juice Thursday...Hope to see you back again this week!